A Joint Mentorship Webinar on Sustainable Hospitality for entrepreneurs will be held on 11 December 2018. The event is praxis-oriented and shall provide support to all interested business persons and professionals in the adoption of technological and non-technological novel solutions for sustainability. Established experts, entrepreneurs and practitioners in hospitality and tourism will conduct the on-line sessions. In addition, the webinar itself is organized in an innovative way combing on-site with on-line activities. Attendance sessions for interested stakeholders will be held at the premises of each partner institution (in Varna, Volos, Durres, Shkodra and Skopje) to provide for building of partnerships in a local and national environment. Simultaneously, on-line interaction between the “national rooms” and sessions will provide for cross-border learning and exchange of ideas. 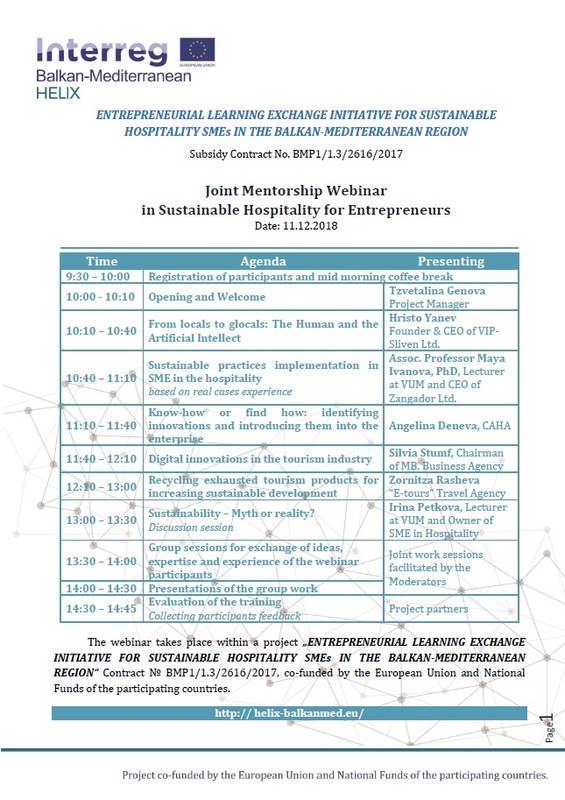 The event is free and open for participation on behalf of all interested entrepreneurs and business representatives from the hospitality sector of Albania, Bulgaria, Greece and FYROM. The registration is already open.